The CP-HM/DM-65 by KRAMER is a HDMI to DVI high-performance plenum rated cable. 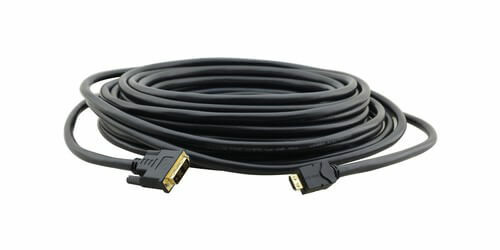 Offering quality construction this cable is a HDMI to DVI single link (18+1 pin) cable that provides excellent conductivity at high frequencies and long life without degradation. Being plenum rated this cable has low smoke and fire resistant properties allowing it to be used in air return spaces of ceilings, floors, and walls, cutting the cost of installing more conduit. The CP-HM/DM was made to connect digital video sources and displays and recorders that don't have both DVI and HDMI connectors.